I am not an artist, but I like creating beautiful things. My kids LOVE playing with paint. So we make a great team. Sometimes our art is lovely. Sometimes it was a great effort. 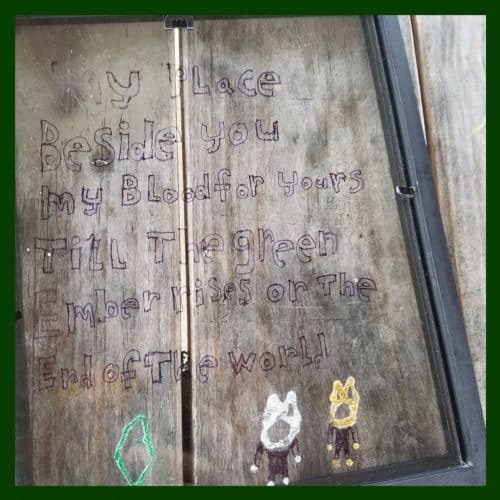 Recently, we held our Green Ember Book Club, and I wanted the kids to have a piece of stained glass art like what was portrayed in the book. 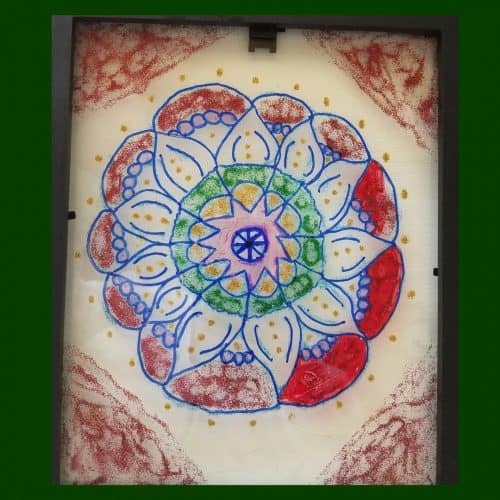 Obviously, real stained glass art is a little out of my knowledge base, so I started researching how to create faux stained glass art with the kids. I started out with a supply list and headed to the massive amount of crafting supplies I have in the garage. I only needed to purchase a few things from the store. Here is a list of the supplies you might need. 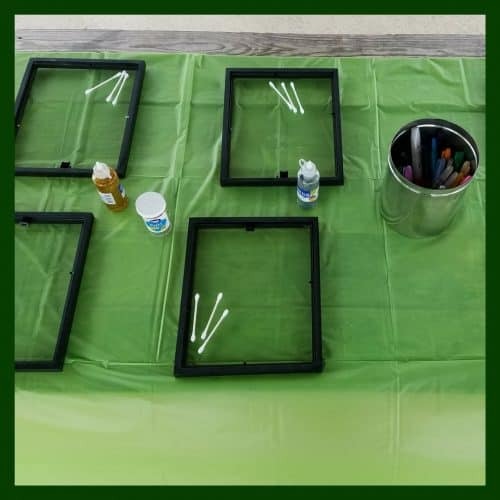 Glass: You can use these 6″ glass squares if you’d rather, but we used picture frames with the backs removed and the hangers replaced. : I’m sure any permanent markers will work, but I love the Sharpie brand and the color choices are so vibrant. 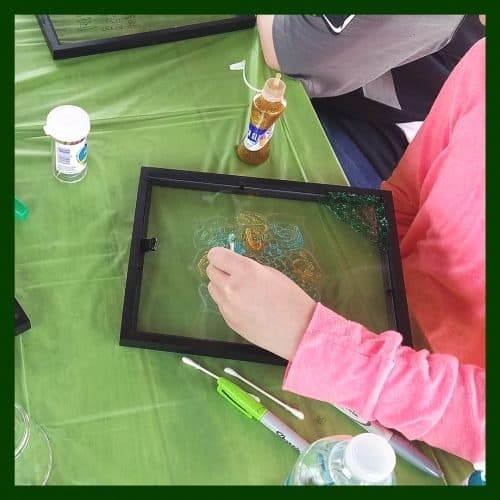 : We used glitter glue to add some sparkle to our designs, but you could use any clear glue. : This can be added to the glitter glue for a color design instead of a transparent design. Liquid Leading: This is optional. If you are looking for a design with an outline, you might want to try this option. Cotton Swabs and Toothpicks: These were used to spread the glue. Once you have all the supplies gathered, it’s time for the design process. If your kids are like mine, they like to do their own thing. So, I just let them loose with the Sharpies. However, if your kids need a little inspiration, feel free to print out a few designs to give them some ideas to begin. Once they’ve decided on a design, just place it behind the glass and let them trace it. Just remember that the design will be backward once the project is finished. 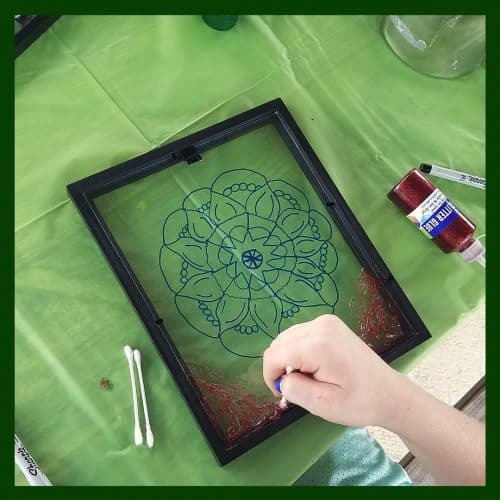 This design, by one of our book club members, had to be turned around in the frame after it dried. After designing, the next step is to add the paint (or glitter glue). Glue is a great medium for this project because it dries clear, but leaves a stained glass effect. Using cotton swabs or toothpicks helps to spread the glue. At this time, you can add in the food coloring with the glue. Just swirl it in with the glue for a colored effect. Here you can see the difference in using the Sharpies versus just the glitter glue. The red colored in parts on the right are from the Sharpie, whereas the left side only has the red glitter paint. Once the painting is dry, it is ready to hang. 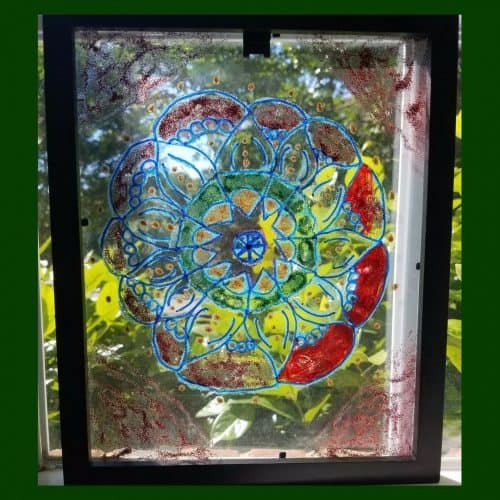 We chose to put our faux stained glass art in the window so we could see the sunlight reflected through the panes. Dachelle is a homeschooling mom of 3 in the South. She loves chocolate and has been known to hide it from her children. She can often be found reading a good book (or even sometimes just an okay book) and enjoying a jar of Nutella — don’t judge. She blogs at HideTheChocolate.com when she’s not planning and making lists…lots and lots of lists (it’s an addiction).